Recognized nationwide among beer enthusiasts, National Beer Day is an unofficial holiday in the United States celebrated every year on April 7, and marking the day in 1933, the first day in 13 years, that people could legally buy, sell, and drink beer. National Beer Day is a celebration of the Cullen–Harrison Act being signed into law by President Franklin D. Roosevelt on March 22, 1933. 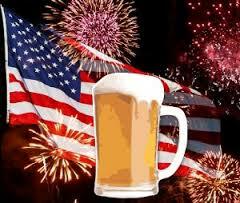 Upon signing the legislation, Roosevelt made his famous remark, "I think this would be a good time for a beer." The law went into effect on April 7 of that year, allowing people to buy, sell and drink beer containing up to 3.2% alcohol by weight (or 4.05% by volume) in states that had enacted their own law allowing such sales. People across the country responded by gathering outside breweries, some beginning the night before. On that first day, 1.5 million barrels of beer were consumed, inspiring the future holiday. Today, April 7 is recognized as National Beer Day and April 6 is known as New Beer’s Eve. National Beer Day was first created in 2009 by Justin Smith of Richmond, VA. After much prodding from his friend, Mike Connolly, Justin started a Facebook page that was noticed by Colorado Beer Examiner, Eli Shayotovich. Justin’s promoting of the new holiday via various social media outlets was rewarded when the beer drinking app, Untappd, created a badge for National Beer Day that rewarded participants that checked a beer into the app on April 7th. National Beer Day has since been trending every year on April 7th using the hashtag #NationalBeerDay.